One of the most important accessories for your laptop is the laptop bag or laptop case: It not only protects your laptop and helps you schlep around all your other gear and papers, the laptop bag also can be a fashion statement. 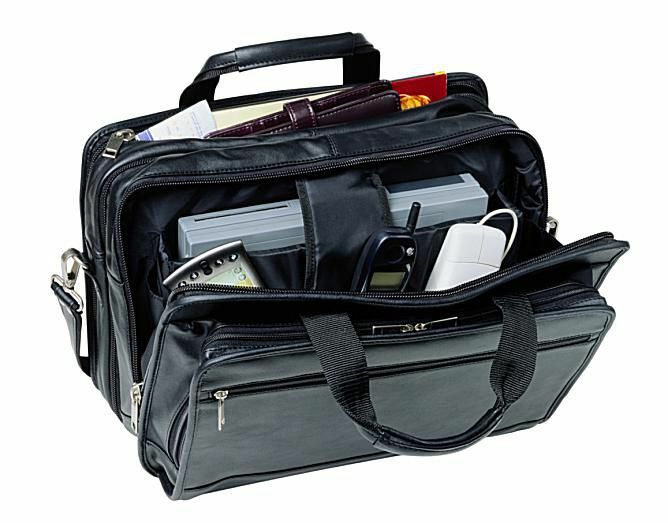 Use this buyer's guide to help you select the best laptop bag for your needs. The bag you choose will depend on several features and considerations, but the most important one is how you plan on using the bag. If you're a frequent traveler, for example, you should look for a bag labeled "checkpoint friendly." If you have a very large and heavy laptop, a rolling case style can help prevent sore shoulders. Carry a lot of papers, a spare battery, portable hard drive, and/or lots of other stuff? Look for both spaciousness and pockets for organization. Don't forget to check the bag's dimensions--both overall dimensions and laptop compartment dimensions--to make sure your laptop will fit in the bag. I asked travel professionals, including popular laptop and luggage makers, what people should look for in a bag, and got some great answers to FAQs about buying the best laptop bag or luggage, including details, like self-repairing zippers, that separate a cheap bag from a quality one. Laptop Sleeves" Laptop sleeves are a snug fit for your laptop and are useful when you want to carry your laptop in another bag that lacks padding. On their own, these sleeves or cases can also be used to carry your laptop securely within your office or from room to room. Look for good padding or a hard shell and self-healing zippers. Two examples are this Case Logic slim sleeve for laptops up to 14 inches and the Everki Camber Netbook Case/Laptop Desk, which doubles as a portable laptop desk. Backpack Laptop Bags: Backpacks are a casual, comfortable way to carry your laptop as well as your other mobile gear. They're great for travelers, students, and city dwellers who need to maneuver easily (be careful when turning, though, in a crowded area, lest you knock someone with your backpack). The shoulder straps distribute the weight evenly and keep your hands free. Look for padded, adjustable straps, and a padded section or removable sleeve for your laptop. Messenger Bags: Messenger bags help you carry your laptop and other items ergonomically too, with their cross-body design. They're great for active people (e.g., bike riders) because they're designed for durability and the best ones have straps to secure the bag around your waist. Look for vinyl lining, a padded strap, and any necessary compartments for your small items. Rolling Laptop Bags: Rolling laptop bags take the weight off your shoulders and are great for toting your stuff across long distances. They're typically bulkier and heavier (thanks to the wheels) than other bags, but you can fit more in them; some even can double as your carryon. Look for rubberized, ball-bearing inline skate wheels, reinforced edges, and a well-padded laptop compartment with high-density foam (for shock absorption--wheeling your laptop can be bumpy). See this selection of top 7 rolling bags. Women's Laptop Bags: Designed for both function and style. Check out this gallery of stylish women's laptop bags. Custom Laptop Bags: Want the most unique laptop bag available? Design your own. These customizable laptop bags also make great gifts.